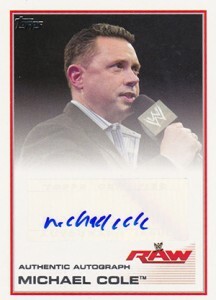 Not surprisingly, autographs have been among the anchors of nearly every Topps WWE wrestling card release since the card maker reacquired the license back in 2005. 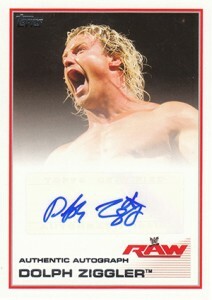 Autographs are one of the key selling points of 2013 Topps WWE as well. Inserted every other hobby box, the 20-card checklist has a mix of veterans, young superstars and legends. And the Bushwackers. 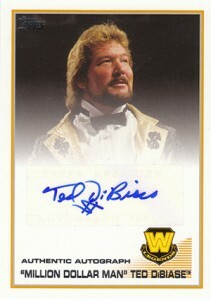 Highlights of the 2013 Topps WWE Autographs checklist include Dolph Ziggler, AJ Lee, Randy Orton, Daniel Bryan and the "Million Dollar Man" Ted DiBiase. 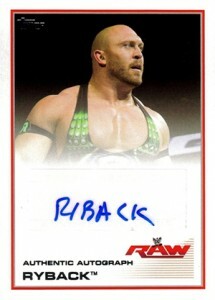 Ryback and Antonio Cesaro are among the first-time signers in the set. 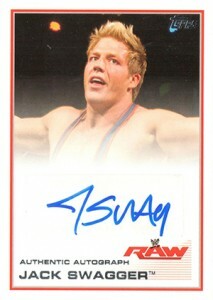 Shop for 2013 Topps WWE Autographs on eBay. 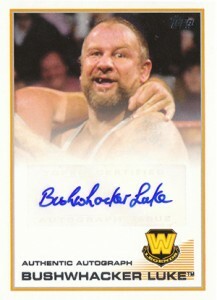 The 2013 Topps WWE Autographs design is very similar to that of the base cards. Bushwackers Butch and Luke fit together to form a puzzle. The big difference is the white signing area. This is somewhat unnecessary, though, as all of the cards use sticker autographs. 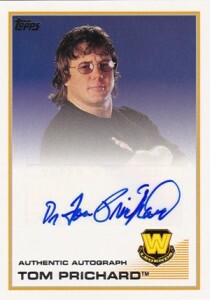 The only Topps WWE release with sticker-free autographs is 2005 Topps Heritage WWE. 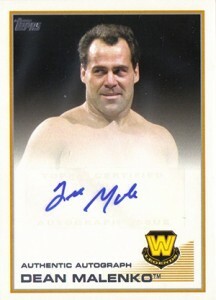 And while there hasn't been a five-star signature checklist since the debut 2005 Topps WWE Heritage release, the overall body of work from the Topps WWE autographs is solid. The likes of the Undertaker, HHH, The Rock and several other top-tier stars have yet to sign for the company. 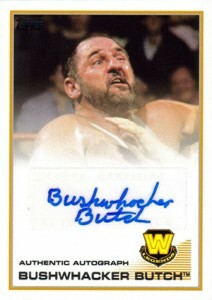 Still, if you take all the different Topps WWE sets, the lineup is fairly deep. Also, by constantly rotating the lineups around, either on purpose or out of necessity, it has meant that the market hasn't been flooded with less-desirable autographs. 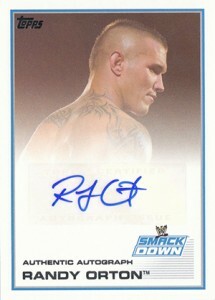 Take a look at the entire set of 2013 Topps WWE Autographs below. Click on their name to shop for singles on eBay. BRUNO SAMMARTINO 2013 WWE TOPPS BEST OF WWE AUTO AUTOGRAPH CARD!